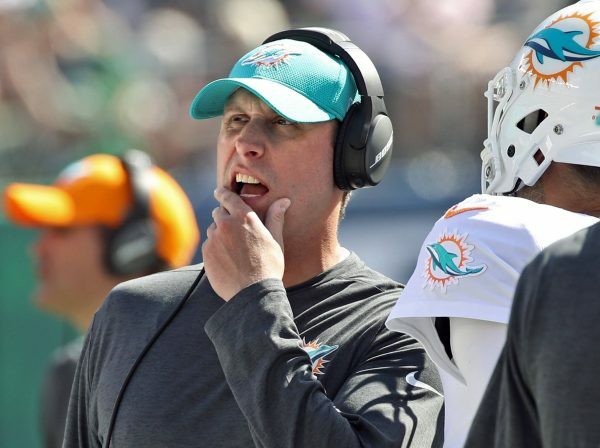 After the Miami Dolphins‘ embarrassing 20-6 loss to the New York Jets on Sunday, head coach Adam Gase hinted on Monday that upcoming offensive personnel changes were likely coming. Gase did not hold back when he talked about his team’s offense and that he was going to make the necessary adjustments to succeed. Miami was unable to get anything going on offense against the Jets, as star running back Jay Ajayi was held to just 16 yards rushing on 11 carries after Gase was forced to abandon the running game early on. Also noteworthy was that before the start of the fourth quarter, the Dolphins had only run one play past the 50-yard line in their opponent’s territory. The Dolphins (1-1) will look to get things going offensively on Sunday morning when they play the New Orleans Saints (1-2) in London at Wembley Stadium.